The Lanier LD-328c color laser printer, copier and scanner is a state-of-the-art, super fast, industrial quality machine that can handle large volume copy jobs while maintaining durability and quality. 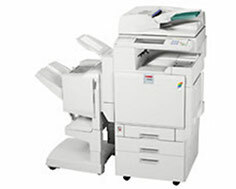 This machine is designed to house a high-speed color printing device in a compact space and is on the lower end of a three model series that offers plenty of expandability options, and is considered to be one of the most durable and cost-effective office document processing solutions. The copy process is executed using a dry electrostatic transfer system that eliminates the need for fuser oil, reducing the amount of waste buildup common to other copiers that can lead to costly maintenance and downtime. This base model prints at a speed of up to 28 pages per minute for black and white and up to 24 pages per minute for professional-looking, business-class color. Multiple page copying is possible up to a maximum quantity of 999 and warm up times are advertised at less than 99 seconds. First copy times are 8 seconds for black and white and 10 seconds for full color. Copy resolution is achievable at a maximum of 600 dots per inch, printing at a maximum of 1,200 x 1,200 dots per inch and scanning at a top resolution of 600 dots per inch with 256 gradations. Standard input capacity is two 500 sheet trays and a 100 sheet bypass tray. Expandability and upgrade options allow for a maximum input capacity of 3,100 sheets. An automatic document feeder is also standard, with automatic duplexing capabilities for paper weights between 14 and 28 pounds, allowing for printing on both sides of a page without having to manually flip and reload sheets. Copier zoom settings can be set to between 25 and 400% of the original in 1% increments. 1GB of RAM is standard and an 80 GB hard disk drive comes built-in and can be shared as a network resource for storing documents and booklets that are frequently printed. Standard connection interfaces in the base model are USB 2.0 and 10/100Base-TX Ethernet, providing means of connecting directly to a computer or connecting to a network hub, router or print server to be used as a shared network resource. Optional connectivity options include a bi-directional parallel port, Wi-Fi, Bluetooth and FireWire, providing a means to connect to all types of devices, including PC's, Macs, PDA's, laptops and older computer systems. An optional fax module with a 33.6 Kbps modem transmits faxed documents at 2 seconds per page and scans pages in 0.86 seconds. Multi-tray finishers can staple up to 50 sheets and can automatically fold 10 to 20 sets of booklets, almost completely automating booklet making processes. Several enhanced features are included, such as auto color selection, auto tray switching, and several series copying, booklet reproduction and collating features, to name a few. Print speeds are considered slow for comparable business quality laser printers and copiers but is considered to be reasonable for this particular line of machines from this company, which are designed to be reliable, durable and cost effective. This unit's scanning resolution is low for standard office copiers, at only half of the standard 1,200 dots per inch. Color depth is only a maximum of 8-bit. The standard paper handling capacity is only one third of the maximum that is possible with full upgrades, resulting in a higher initial purchase price for a company who is looking to do high volume printing and copying. The 1 GB RAM memory module that comes standard is not upgradeable and is expected to suffice for functions that this model is rated for. Review it: "Lanier LD328c "
The cartridges that come standard with the Lanier LD-328c right out of the box are one black, one cyan, one magenta and one yellow. 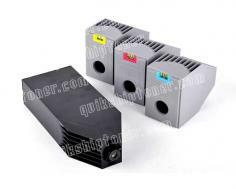 The black cartridge has a yield of 19,000 pages. 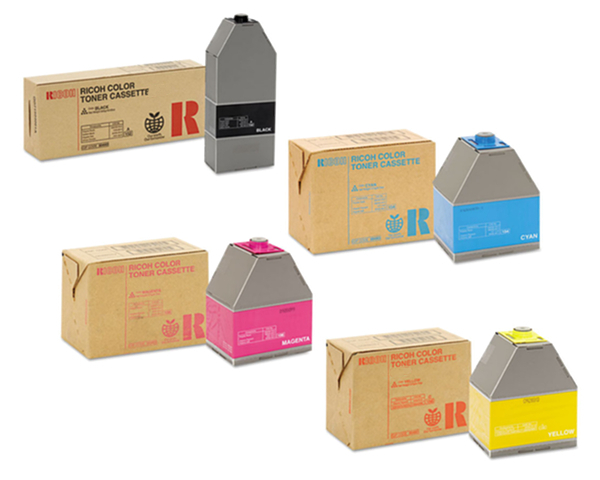 Color toner cartridges have an average yield of 10,000 pages each. 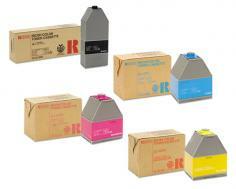 These are maximum capacities for these cartridges and no other yield capabilities are available.